The most famous and most widely visited site in the Honolulu/Waikiki Beach area is the historic Arizona Memorial at Pearl Harbor. The USS Arizona was one of many American battleships that went under attack in Pearl Harbor by the Japanese Imperial Navy on December 7, 1941. On that infamous day, 1,177 United States military personnel perished on board the USS Arizona, which sunk to the bottom of Pearl Harbor. As a way to honor all 2,390 United States military personnel who perished on December 7, 1941, the USS Arizona became a memorial, which was dedicated in 1962. Today, visitors have the opportunity to visit the Pearl Harbor Visitor Center, which is part of the National Parks Service. At the Visitor Center, visitors can view historical information and a 23-minute film on the terrible events on December 7, 1941. From the center, visitors are then transported on a short boat ride to the memorial. Visitors will get a firm sense of what it was like on board the USS Arizona nearly 70 years ago. Tickets to the Arizona Memorial run out quickly so it is best to purchase tickets in advance of your visit. 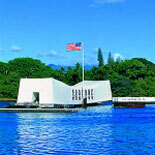 If you purchase tickets through Trusted Tours, you will have transportation and admission not only to the Pearl Harbor Memorial but also to the Punchbowl, which is the National Memorial Cemetery of the Pacific. The Punchbowl is actually an extinct volcano whose shape resembles a punch bowl. The Punchbowl is also a very popular tourist destination with thousands of people visiting the cemetery each year. The cemetery is the final resting place for over 13,000 soldiers and sailors who died during World War II. Two of the most notable graves are that of Hank Hansen, who was one of the flag raisers on the island of Iwo Jima, and the grave of famous war correspondent Ernie Pyle.